Aumora Foundation was founded in 2014 with the initial mission of promoting education and helping the underprivileged society in Bangladesh. As the foundation expanded, various other projects were undertaken. Some current projects include the student scholarship, old age allowance, and health treatment programs. Aumora Foundation finds students who require financial aid to carryout their education and provides them with the support they require. In January of each year, Aumora Foundation accepts applications from students and also urges any eligible students to apply. The foundation analyzes each students’ basic needs to continue their education, keeps contact with them throughout the year about their academic progress, and provides consultation or guidance regarding career preparation. The foundation also extends its cooperation towards poverty-stricken elders who do not have sufficient physical or financial capability to support themselves. Aumora Foundation provides monthly allowance to these helpless elderly people, who would otherwise have no one to take care of them. These elders depend on this foundation to provide them with basic human needs. Aumora Foundation’s biggest project revolved around the health treatment program. The foundation aspired to provide basic health care facilities to the poor people residing in rural areas. With this target in mind, the Foundation completed the construction of Mollabari Charity Medical (MCM) Center at Nitai Nagar, a rural village of Natore, Bangladesh at the cost of 15 lakh BDT in June 2016. The Charity Medical Center started its activities on June 10, 2016 by hiring a part-time MBBS doctor. The focus is now not only to provide basic health care services, but to also arrange for occasional specialist doctors to sit in at MCM center. 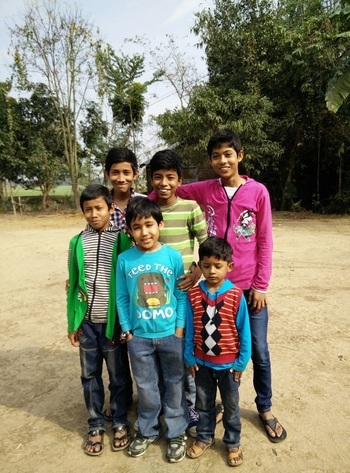 MCM’s future mission is to carry out satellite medical treatment camps in poverty-stricken areas of Bangladesh, and arrange seminars by specialist doctors to educate rural people on common diseases, such as diabetes and gynecology. On the side, Aumora Foundation also provides supports to the families facing sudden financial hardship by natural calamities such as flooding, fire etc. All of the projects mentioned above have been completely and personally financed by the founder of Aumora Foundation, Mozammel Hoque PhD. Dr. Hoque is a mechanical engineer working in a US based consulting company at Bellingham, Washington. Dr. Hoque does not have any other business or sources of income. To run the projects in an efficient and sustainable basis, any sort of financial assistance would be greatly appreciated. Dr. Hoque cannot ensure the continuation or expansion of this foundation with his income alone. Please donate now and help continue these projects to make a positive impact in Bangladesh.